It's another surprise to think that somewhere back in our Celtic/Gothic past that Attilas' daughter married into our family. I've also checked into the Chinese connection and find that we go back into the Han Dynasty. Attila the Hun, was the ruler of the Huns from 434 until his death in 453. He was leader of the Hunnic Empire, which stretched from the Ural River to the Rhine River and from the Danube River to the Baltic Sea. During his reign he was one of the most feared enemies of the Western and Eastern Roman Empires. He crossed the Danube twice and plundered the Balkans, but was unable to take Constantinople. He also attempted to conquer Roman Gaul (modern France), crossing the Rhine in 451 and marching as far as Aurelianum (Orléans) before being defeated at the Battle of the Catalaunian Plains. Subsequently he invaded Italy, devastating the northern provinces, but was unable to take Rome. He planned for further campaigns against the Romans but died in 453. There is no surviving first-person account of Attila's appearance. There is, however, a possible second-hand source, provided by Jordanes, who cites a description given by Priscus. It suggests a person of Asian features. Short of stature, with a broad chest and a large head; his eyes were small, his beard thin and sprinkled with grey; and he had a flat nose and tanned skin, showing evidence of his origin. The origin of Attila's name is unclear. Pritsak considers it to mean "universal ruler" in a Turkic language related to Danube Bulgarian. Maenchen-Helfen suggests an East Germanic origin and rejects a Turkic etymology: "Attila is formed from Gothic or Gepidic atta, "father", by means of the diminutive suffix -ila." He suggests that Pritsak's etymology is "ingenious but for many reasons unacceptable". However, he suggests that these names were "not the true names of the Hun princes and lords. What we have are Hunnic names in Germanic dress, modified to fit the Gothic tongue, or popular Gothic etymologies, or both. 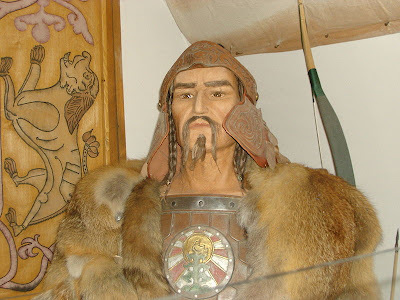 Mikkola thought Attila might go back to Turkish atlïg, "famous"; Poucha finds in it Tokharian atär, "hero." The first etymology is too farfetched to be taken seriously, the second is nonsense." The name has many variants in modern languages: Atli and Atle in Norse, Attila/Atilla/Etele in Hungarian (all the three name variants are used in Hungary; Attila is the most popular variant), Etzel in German Nibelungenlied and Attila, Atila or Atilla in Turkish. Daughter of Attila "The Scourge of God"
...just like in the movie "Elizabeth"